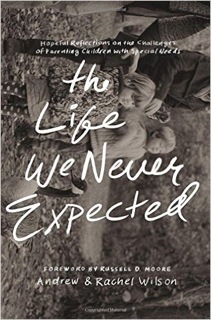 The Life We Never Expected was written by Andrew and Rachel Wilson. The typical married couple that have two children, however, their children are regressive autistic. Not something you think about when you decide to have children. I don’t think there is a parent alive that plans for a child with disabilities. When you’re pregnant it’s all about having a baby! The joy of being pregnant and welcoming a new little one into the world. And for Andrew and Rachel they did have the excitement and joy of having two little bundles of joy. It wasn’t until a few years after their children were born, they were diagnosed with regressive autism. The first chapter of The Life We Never Expected talks about the family being on vacation. It’s not going as planned. Andrew has been taken down by a stomach virus, which leaves Rachel alone the kids. As Rachel is walking me through her day I’m getting exhausted! She is always on. I know as a parent you are always on but Rachel is always on high alert. In some ways I can relate. Peyton has sensory issues and no one in my family understands it. A big trigger for her is the loud unknown or huge crowds or mascots. Yes, I know many kids are scared of mascots. But when I say Peyton has a sensory issue it’s more than the typical fear. For example, we cannot go to Chuck E Cheese. If Peyton even hears the word mouse or Chuck E Cheese she starts to shake, breathe fast and starts to look for somewhere to hide. If she sees the mouse, she immediately dives for the nearest table or chair and has a complete meltdown. That is not normal. Another example is on our family vacation to Disney World, Peyton could not handle character meals. She wanted to be there but she couldn’t handle the characters. It was too much. Her solution was to sit under our table and eat dinner from her chair while she barricaded herself in with my purse, backpack, blanket and anything else nearby. Is this normal? No, but when you have a child with sensory issues you make accommodations to what makes them feel safe. I wish I would’ve had The Life We Never Expected a few years ago. I’ve muddled my way through this on my own and did the best I could do with the negative comments from friends and family. The Life We Never Expected offers hope to other parents who are dealing with a child with disabilities. It offers a different perspective and helps you reflect on life. It helps to empower you and remind you that you are in charge of your joy and happiness. I have now learned that I just don’t care what others think. I do what is best for my daughter and myself. If she wants to sit under a table to eat because it’s safe, than so be it. I just bring along an extra blanket so she has something comfortable to sit on. If you are struggling with parenting a child with or without disabilities you should give The Life We Never Expected a read. It’s a reminder that we are not alone and that there is someone or something bigger you can lean on during tough times.